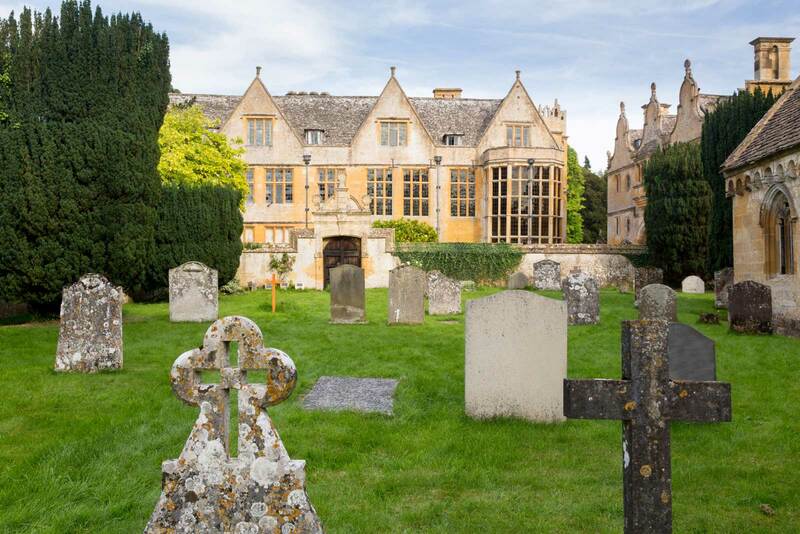 Stanway House is an outstandingly beautiful example of a Jacobean manor house, owned by Tewkesbury Abbey for 800 years then for 500 years by the Tracy family and their descendants, the Earls of Wemyss who still live there. The house, its fascinating furniture, the jewel-like Gatehouse, the church and 14th-century Tithe Barn, the 18th-century water-garden, the specimen trees and avenues, the surrounding villages, farms, parkland and woodland all subtly combine to create an enclave of very English and almost magical harmony. Thanks to its location, at the foot of the Cotswold escarpment, Stanway House has been protected from many changes of the 20th century. Recently it has seen the gradual restoration of the 18th century watergarden, probably designed by the greatest of British landscape gardeners, Charles Bridgeman. The formal Canal, on a terrace above the house, the striking Pyramid and eight ponds have been reinstated, and a single-jet fountain, at 300 feet the highest fountain in Britain and the highest gravity fountain in the world, has been added. Stanway House is noted for its mellow, peaceful atmosphere, created by its age (it was finished in the calm decade before the Civil War), by its stone (a delicious Cotswold stone known as Guiting Yellow), by its architecture (Jacobean mullions and gables and Cotswold slates), by its furniture (most of which, like the Charles I working shuffleboard table, has been in the house since it was made), and by its setting (sheltered in a hollow at the foot of the Cotswold escarpment, close to the church, Gatehouse, Tithe Barn and cottages and surrounded by an enchanting garden and ancient parkland). The charming interior gives every appearance of being lived in, and in no sense resembles a museum. magnificently to over 300 feet, making it the tallest fountain in Britain (seconded by Witley Court at 121 feet), the tallest gravity fountain in the world (seconded by the Fountain of Fame at La Granja de San Ildefonso, Segovia, Spain at 154 feet), and the second tallest fountain in Europe, after the 400-foot-high turbine-driven fountain in Lake Geneva. The fountain has a 2-inch bronze nozzle and is driven from an 100,000-gallon reservoir, 580 feet above the Canal, via a 12-inch diameter medium-density polyethylene pipe 2 kilometres long. The Stanway House Watergarden, one of the finest in England, was created in the 1720s for John Tracy, probably by Charles Bridgeman, gardener to Lord Cobham at Stowe, Buckinghamshire from 1719 and Royal Gardener from 1727, who invented the English style of gardening, which superceded the Franco-Dutch style. Typically Bridgemanic is the Canal, a magnificent formal sheet of water, situated unusually on a terrace 25 feet above the house, and the Cascade (the largest in Britain, partially restored), fed by water flowing under the Pyramid from the Pyramid Pond. The Tithe Barn Pond adds to the watery feel of the garden, which also includes fine specimen trees, broad terraced lawns and herbaceous borders. Why not visit Stanway House and other pretty Cotswold villages on one of our driver-guide or cycling Tours of the Cotswolds?